Located in the heart of downtown on a quiet street, 20 metres from the world famous Opera House which itself is located on Andrasy ut, the boulevard of Budapest. Andrassy ut and the surrounding area is very much the essence of Budapest wide boulevards, imposing classical buildings, grand architecture, theatres, galleries and many cafes and restaurants. The 6th district is also considered the main area for the locals and visitors alike for an evening out, whether your interest lies in the opera and the arts, jazz and blues live music, simple evening in a café or restaurant or seeing the night through in a nightclub. At the end of Andrassy ut is Heroes square, the City Park and the Szechenyi thermal baths, a must for any visitor to Budapest. 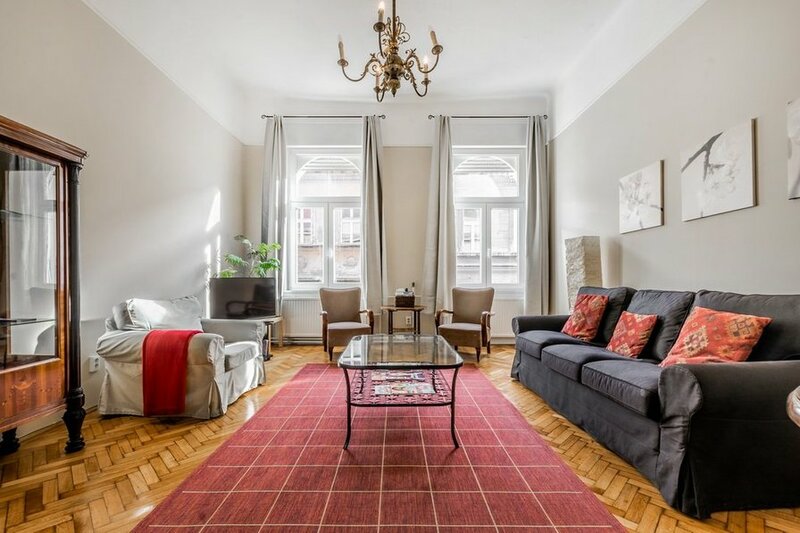 A spacious apartment ideal for families or group of friends this apartment is typical to Budapest with its 4 metre high ceilings. The living spaces consist of a fully equipped kitchen and dining room and a large living room. There are 2 bedrooms, the master bedroom benefits from a double bed, the small balcony and is en suite to the main bathroom which has a WC, corner bath and separate shower unit. The 2nd bedroom has 2 single beds, looks on to the quiet courtyard and also enjoys its own shower room. The living room is furnished with a double sofa bed enabling the apartment to accommodate up to 6 people.